Never had savory biscotti? Domenica Marchetti wants to change that. Her book Ciao Biscotti is filled with sweet classics, several savory options and a hefty sprinkling of brand new takes on this classic twice-baked cookie. 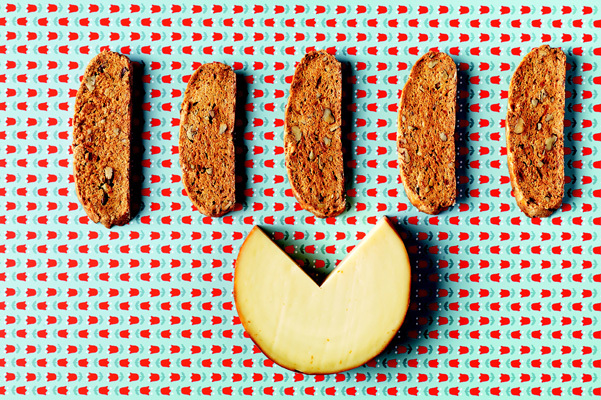 This Smoky Gouda Biscotti features two kinds of paprika – sweet and smoky. Don’t skimp on either as they bring the necessary nuances to the cookie. The whole-wheat flour adds to the savory-ness and heartiness. Fabulous with a glass of wine and Domenica makes some suggestions in her Tips. Also check out her Browned Butter and Toberlone Biscotti. Now Toberlone is an underutilized chocolate bar as far as I am concerned and her addition of browned butter complements the milk chocolate and nougat beautifully. Excerpted with permission by publisher. Ciao Biscotti by Domenica Marchetti, published by Chronicle, 2015. Images by Antonis Achilleos. Smoked paprika may not be Italian, but it’s one of my favorite savory spices. I love it sprinkled on roast potatoes, in egg salad, in soups and stews, and in these fragrant biscotti. I wanted to underline that smoky flavor, so I added a generous quantity of smoked Gouda cheese to the mix. Heat the oven to 350°F/180° C. Lightly coat an 11-by-17-in/28-by-43-cm rimmed baking sheet with the vegetable oil. Combine the all-purpose flour, whole-wheat flour, baking powder, salt, sweet paprika, and smoked paprika in the bowl of a stand mixer fitted with the paddle attachment. Mix briefly on low speed. Add the pecans and mix to combine and to break up the nuts into small pieces. Add the cheese and mix briefly on low to combine. Add the butter in pieces and mix on medium-low speed until the mixture looks like damp sand. Set aside 1 Tbsp of the beaten eggs. Combine the remaining eggs with the olive oil and milk and pour into the mixing bowl. Mix on medium speed until a soft, slightly sticky dough has formed. Turn the dough out onto a lightly floured work surface and pat it into a disk. Divide it in half. Lightly moisten your hands with water and gently roll one portion of dough into a rough oval. Place it lengthwise on one half of the baking sheet and use your hands and fingers to stretch and pat the dough into a log about 2 ½ in/6 cm wide and 12 in/30 cm long. Shape the second piece of dough in the same way, moistening your hands as necessary. Press down on the logs to flatten them out a bit and make the tops even. Brush the reserved egg over the tops of the logs. Bake the logs for 25 to 30 minutes, or until they are lightly browned and just set—they should be springy to the touch and there should be cracks on the surface. Transfer the baking sheet to a cooling rack. Gently slide an offset spatula under each log to loosen it from the baking sheet. Let the logs cool for 5 minutes, and then transfer them to the rack and let cool for 20 minutes. Lower the oven temperature to 325°F/165°C. Transfer the cooled logs to a cutting board and, using a Santoku knife or a serrated bread knife, cut them on the diagonal into ½-in-/12-mm-thick slices. Arrange the slices, cut-side up, on the baking sheet (in batches if necessary) and bake for 20 minutes. Turn the slices over and bake for another 15 to 20 minutes, until they are crisp and golden. Transfer the slices to the rack to cool completely. The biscotti will keep for up to 10 days in an airtight container stored at room temperature. What to drink: Dolcetto di Dogliani, a smoky red wine from Piedmont, if you can find it. Otherwise, Dolcetto d’Alba.